Follow this OpenVAS Tutorial to get an overview of OpenVAS management and administration. With a focus on the backend services this will allow you to get the full OpenVAS Vulnerability Scanning Framework up and running. Additional tips for troubleshooting and testing individual checks rounds out the tutorial. About: HackerTarget.com provides an online hosted version of OpenVAS for convenient and easy access to OpenVAS, allowing immediate vulnerability scanning of Internet facing servers. OpenVAS is comprised of a number of services and clients, by understanding the role of the different components you will be much better able to effectively administer OpenVAS servers. Communication from the client to the OpenVAS Manager is done using the OpenVAS Management Protocol (OMP). NVT refers to Network Vulnerability Test. These are conducted using plugins that are developed in NASL code. The scripting language is a legacy of its original Nessus code base. NASL is the Nessus Attack Scripting Language, a scripting language for the testing of vulnerabilities first developed in 1998. With inspiration from the C programming language, non-coders wishing to quickly develop a vulnerability test may be better served by Nmap and its LUA based NSE (Nmap Scripting Engine) scripts. On a typical OpenVAS server there will be tens of thousands of .nasl files, these are the vulnerability checks that are used by the OpenVAS scanner service. A guide to updating the NVT's can be found in this tutorial below. For those wishing to install OpenVAS on Ubuntu we have a complete installation guide available, that covers not only the base installation but also a number of optional additions to increase the effectiveness of our favorite vulnerability management solution. The most famous of the Linux Penetration Testing distributions, Kali Linux is a popular choice for quickly getting tools up and running as many are pre-installed and pre-configured. Installing OpenVAS is very straightforward. Simply run the apt install and then run the configure script. User created with password '* password that looks like uuid *'. From the official OpenVAS installation page getting up and running with Fedora is a few simple steps. Note that these steps also apply for RHEL and CentOS. The advantage of installing from source is that you get the most up to date version of OpenVAS. In this source installation guide for Ubuntu we step through the steps of getting OpenVAS installed from source. Of course depending on your Linux distribution the required development packages will be different. While the linked guide is specifically for OpenVAS 7 and Ubuntu, the basic process can be followed for other versions and distributions. The OpenVAS Web Interface (gsad) runs on TCP port 9392. However depending on your installation it could also be listening on TCP 443. After installation this can be confirmed by checking the listening ports on your system. From these ports, we can see in our installation gsad is running on port 443. The OpenVAS Scanner (openvassd) is running on TCP Port 9391 and the OpenVAS Manager (openvasmd) is running on TCP port 9390. Lastly is the redis-server on TCP 6379. This database is used to store temporary meta data during active scanning. 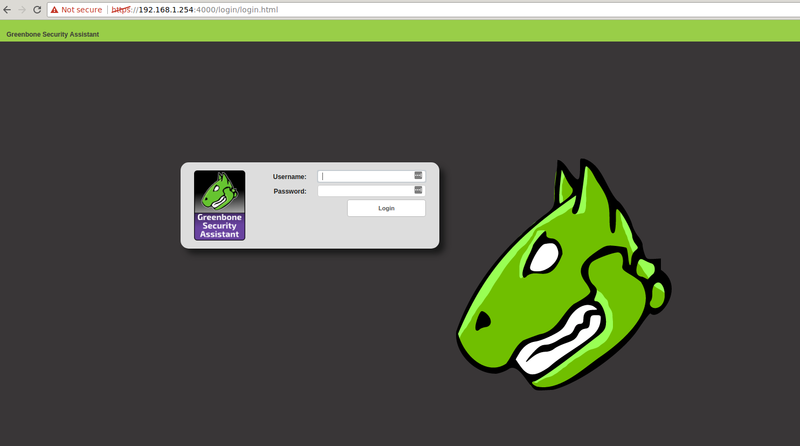 Opening https://server-ip/ in our browser shows the login screen for the Greenbone Security Assistant. It is important to know the locations of your OpenVAS log files and configuration. This will allow faster troubleshooting and management of your server. The prefix of the path will generally depend on how OpenVAS was installed. A default source installation will put all the files under /usr/local/ while most packages will put the files in the expected locations /etc/openvas/, /var/lib/openvas and /var/log/openvas/. The most common location will be /usr/local/var/log/openvas/ or /var/log/openvas/. In here you will find the key log files, where you should look if things are not behaving as expected. The primary configuration file for the OpenVAS scanner is openvassd.conf, if this file is not present then default settings are used for all the available options. Location of the file is usually /etc/openvas/ or /usr/local/etc/openvas/. Check the current running configuration with this tip. Running openvassd -s on a server with openvassd running will result in the current configuration being shown. If the configuration file is not present these will be the default settings. If your build of OpenVAS does not include a default configuration file you can simply use the output from openvassd -s. Simply redirect the output straight to your configuration location and proceed with making changes to the configuration. Ensure you are not overwriting an inplace configuration with the following command. The key command for updating NVT's on the system is openvas-nvt-sync. Ensure the full process below is followed however, as without the rebuilding of the NVT cache /var/cache/openvas/. The new updated checks will not be used by the scanner. After syncing the latest NVT's it is neccessary to have the OpenVAS manager update its NVT cache. This can be done by openvasmd --update if the manager is running or openvasmd --rebuild with the manager stopped. The second option is much faster. With the above process output we can see that the update has been successful. The Scanner and Manager are ready to start scanning. Usually required for automating OpenVAS scans, the command line client (omp) for OpenVAS allows you to turn the system into custom solution for your own needs. The omp command has a large number of options. A nice feature is the ability to save your connection credentials into a file so they don't have to be repeated on the command line. While there are a number of shortcuts that can be used as command line parameters, for full control the XML option is the go to option. This gives you full control over the system. -v, --verbose                    Verbose messages (WARNING: may reveal passwords). --use-certs                      Use client certificates to authenticate. --config-file=      Configuration file for connection parameters. -P, --prompt                     Prompt to exit. -O, --get-omp-version            Print OMP version. -n, --name=                Name for create-task. -C, --create-task                Create a task. -m, --comment=             Comment for create-task. -c, --config=            Config for create-task. -t, --target=            Target for create-task. -E, --delete-report              Delete one or more reports. -D, --delete-task                Delete one or more tasks. -R, --get-report                 Get report of one task. -f, --format=            Format for get-report. -G, --get-tasks                  Get status of one, many or all tasks. -i, --pretty-print               In combination with -X, pretty print the response. -S, --start-task                 Start one or more tasks. -M, --modify-task                Modify a task. --file                           Add text in stdin as file on task. -X, --xml=              XML command (e.g. ""). "-" to read from stdin. --send-file=               Replace SENDFILE in xml with base64 offile. A very simple example of sending an XML query using the omp client is to actually ask for help. The response from this command gives details of other possible XML queries. Once the scan has completed you can retrieve the report using the get_reports XML. Requires the report_id and the format_id parameters. Initially this may seem a bit overwhelming however, it is quite logical once you step through the process. Don't forget to use the query commands to get the different target / task / report / format identifiers as you go through the process. Whether you wish to troubleshoot an NVT that is not working or test a single vulnerability the openvas-nasl command is your friend. This handy tool allows quick checks and debugging of broken plugins. -d, --debug                         Output debug information to stderr. -B, --both                          Run in description mode before running the script. -e, --source-iface=     Source network interface for established connections. The following error is a common occurrence when attempting to run the command. This is due to a failure in the signature check as shown in the error. Fixing it is mostly straight forward. Note in the test command we have used the -p parameter. This is a good way to test things out, it simply attempts to parse the nasl script and will reveal any errors or other problems (such as missing signatures). Full details of the Trusted NVT's is available, however we will jump into creating a private key, importing the OpenVAS plugin key and signing. So we can get on with our testing. Answer the questions as required to create your keyring and key. Then grab the official OpenVAS Transfer key. Final step is to get things signed. Now we have all the GPG signing sorted, lets try our test again. That looks much better. Now we can test against a target. Keep in mind that we are running these plugins standalone from the OpenVAS manager so the target ID's from the command line section are not relevant. Our target is simply the target host or IP address. Doh! Almost there. This error is indicating that the plugin requries http_func.inc and it can not be found. So we simply need to indicate the location of the plugin directory to the openvas-nasl command. In addition we can use -d, the debug option to get more information. After running OpenVAS a number of years, this is an issue I have stumbled across more than once. The different OpenVAS components have certificates for encrypting the communication between components (including clients). These certificates expire and when that happens things break. The Manager can't talk to the Scanner for example. The first error you may see is something like "503 service temporary down / unavailable". Checking the OpenVAS Manager log file will reveal. So lets create new certificates for both server and clients. And now for the client certificates. lib auth: INFO:2017-11-10 22h07.31 utc:12819: Authentication configuration not found. Following this everything is back on track. Redis contains data known as the KB. This is a store of information related to current scan tasks. The Redis server is accessed by OpenVAS using a unix socket /tmp/redis.sock. It is possible to monitor data going into the Redis KB using the standard Redis monitoring command. OpenVAS is a highly capable and powerful vulnerability testing solution. Hopefully this tutorial and included tips will prove useful to users out there. The team at Greenbone Networks, along with the community and other supporters have done a fantastic job building OpenVAS. The latest version has a range of fantastic new features and optimisations that have been a big step forward. For some of these items I have only scratched the surface. Use the information here as pointers to allow you to dig deeper into the OpenVAS system. There is a lot of good information available on the OpenVAS site and from the mailing list archive. Another often overlooked location for further information is the man pages for the openvassd and openvasmd servers. New vulnerabilities are discovered in software on a daily basis.